The reason for this is because the five types of grain are included in the Seven Species that the Land of Israel was praised with, since the Land of Israel was praised with wheat and barley; spelt is a species of wheat and oat and rye are species of barley. Thus, all five grains are included in the Seven Species that Israel was praised with. However, rice is not one of the Seven Species; thus, its after-blessing is “Boreh Nefashot Rabbot” similar to other vegetables and legumes. We shall now discuss the law regarding rice cakes. 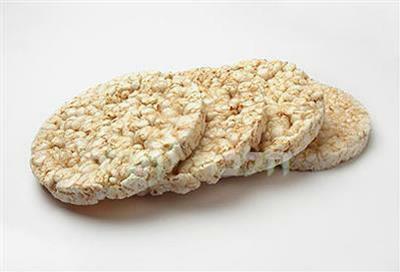 Since the rice in these cakes is noticeable and it is clear that it has only been puffed and not cooked, Maran Rabbeinu Ovadia Yosef zt”l rules that the proper blessing for such rice cakes is “Boreh Peri Ha’adama,” for eating rice cakes is similar to eating uncooked rice for which the Baraita states one recites the Ha’adama blessing. Summary: The proper blessing for rice is “Boreh Minei Mezonot.” If one eats a Kezayit (twenty-seven grams) of rice, one must recite the “Boreh Nefashot” after-blessing. The same law applies to one who eats puffed rice cereal (“Rice Crispies”) since the grains of rice are cooked before they are toasted and the proper blessing is Mezonot. However, the blessing for rice cakes is “Boreh Peri Ha’adama” since the rice is uncooked, similar to the law regarding one who eats any other legumes.